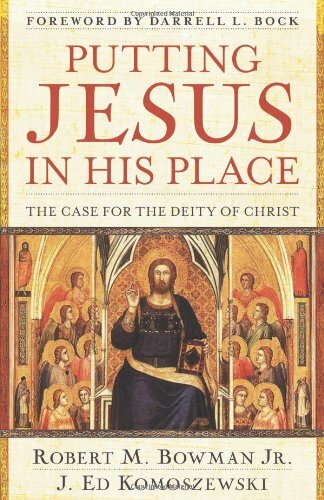 I believe that I have referenced "Putting Jesus In His Place" in past blog posts because it is a great book on the deity of Jesus. I needed it for one of my classes and happened to get it for free on kindle. Bowman's book breaks down into 4 parts: Jesus has the Honors, Attributes, Names, and Deeds of God. Check out his book for more discussion on critical views of the deity of Christ as well as why the evidence points to Jesus being God. This blog post is greatly influenced by his book as well as the third Fundamental Truth of the Assemblies of God. A large part of the Christian faith is that Jesus was and is in fact God. Some groups want to say that Jesus was a really good person, a great teacher, and maybe a prophet (in their religion of choice). You might be thinking, “what’s it matter if He wasn't God He still did great things, believing that is what matters right?” No. Jesus is either God or He isn't and if He isn't then He is a liar. That doesn't sound like a good person, teacher, or prophet does it? What do I mean? Jesus claimed to God which is why the Jews constantly accused Him of blasphemy because they did not believe that Jesus could be God. If Jesus was who He said he was, then He was not a liar but He was in fact God. The Bible talks about Jesus in ways that are only appropriate of God. We are only suppose to worship God. Exodus 20:3 simply says, “You shall have no other gods before me.” But lets look at Revelation 5. It is all about the worthiness of Jesus. Verse 12 says, “Worthy is the Lamb who was slain, to receive power and wealth and wisdom and might and honor and glory and blessing!” The chapter ends with both the one who sits on the throne and the Lamb being worshiped; God the Father and God the Son are being worshiped. Jesus is God the Son, which allows Him to be worshiped along with God the Father. They are both God. If Jesus is not God, the Bible mistakenly and heretically glorifies Jesus. Next lets take a look at John 8:31-59. We start out seeing that the Pharisees say that Abraham is their father and end with Jesus saying that He is greater and before Abraham. "Jesus said to them, “Truly, truly, I say to you, before Abraham was, I am.” So they picked up stones to throw at him, but Jesus hid himself and went out of the temple." There are two aspects that I want to explore. The first is that Jesus claims to have existed before Abraham, which if He wasn't Jesus would be crazy. The second is what He ends His sentence with, "I am." This is the same "I am" that spoke to Moses in the burning bush and told him to tell the Israelites "I am who I am." The Jews clearly understood that Jesus was claiming to be the God of Abraham, which is why they wanted to stone Him. Finally I offer you what seems to be the super verse on the Deity of Jesus or the nail in the coffin proving He isn’t. Some people say that this is proof that Jesus didn't think that He was equal with God but it is saying that Jesus became human when He was God and that He again has been exalted. He never stopped being God but He did put aside His right to glory and honor when He became human. The rest of the verse is all about how Jesus is exalted to the highest place and will be worshiped by everyone. If He isn't God, then I have no clue why any of this is okay with God when they will be worshiped together. I wanted to quickly address something that I had heard in the past when people would say that Jesus was not God, He was the Son of God. Jesus is the Son of God but this title does not make Him any less than God. In Matthew 26:63-66, Luke 22:70-71, and John 19:7 the Jews want Jesus to be put to death since He doesn't disagree with them calling Him the Son of God. Claiming to be the Son of God must be more. John 5:18 says, “This was why the Jews were seeking all the more to kill him, because not only was he breaking the Sabbath, but he was even calling God his own Father, making himself equal with God.” If Jesus saying that God was His Father means that He was making Himself equal with God, then surely being the Son of God makes Him equal with God.